Ljuset på Stockholm i amerikansk satsning på teckning. Teckningen som konstform är på uppåtgående. Detta märks när Frost Art Museum Maimi Florida/USA lanserar onlineutställningen och webbsidan :The Drawing Project; What is line and how does it travel through space. I Pontus Hultens legendariska utställning ”New York Collection for Stockholm” 1973 på Moderna Museet utgjorde Robert Rauschenbergs förarbeten till ”Monogram” (Geten) samt Nam June Paiks ”Do You Know” två viktiga bidrag. Dessa verk visas nu i ”The Drawing Project” tillsammans med arbeten av bl a. David Hockney , Ad Reinhart och Andy Warhol. Stockholmsbaserade konstnären Stefan Berger deltar med verket ”Cowboy Boy”. Stefan har under de senaste åren mottagit en rad nationella och internationella utmärkelser för sin teckning, nu senast tilldelades han första pris vid Biennale of Awarded Artist at Osten. The Drawing Project; What is line and how does it travel through spaceär en unik digital satsning där curatorn Emmy Mathis visar på nya vägar att presentera teckning för en konstpublik. Webbsidan innehåller även en projektyta och kommer att fungera som ett levande forum för teckning. Utställning och hemsidan invigs den 3 april då Frost Art Museum även kommeratt arrangera en paneldiskussion runt teckning. The spotlight on Stockholm in American exhibition on drawing. Drawing as an art form is on the rise. This is evident when the Frost Art Museum Maimi Florida / USA launches the online exhibition and website: The Drawing Project; What is line and how does it travel through space. In Pontus Hultens legendary exhibition ”New York Collection for Stockholm” in 1973 at the Modern Museum Robert Rauschenbergs sketch for ”Monogram” (Goat) and Nam June Paiks ”Do You Know” were two important contributions. These works will appear in ”The Drawing Project” along with the works of David Hockney, Ad Reinhart and Andy Warhol. 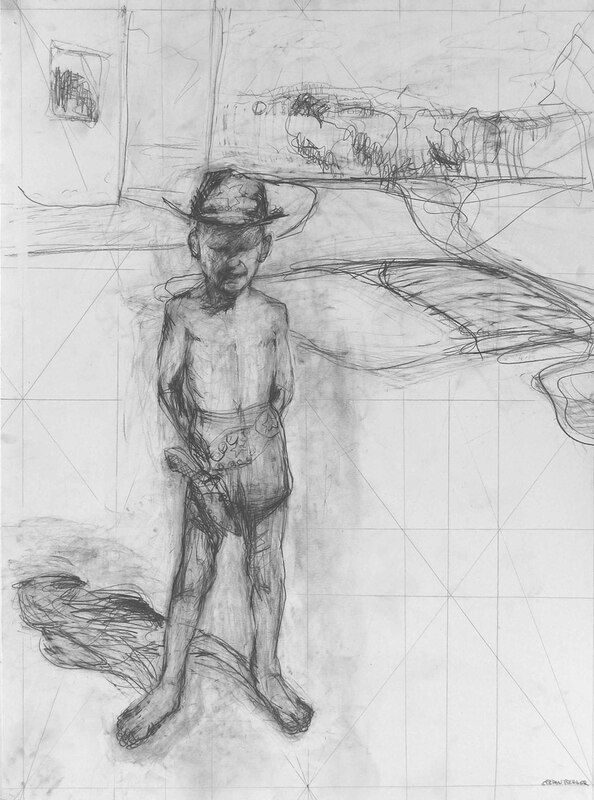 Stockholm-based artist Stefan Berger participates with his work ”Cowboy Boy”. Stefan has in last years received numerous national and international awards for his drawing, most recently, he was awarded first prize at the Biennale of Awarded Artist at Osten. The Drawing Project; What is line and how does it travel through space is a unique digital venture in which the curator Emmy Mathis shows new ways to present the drawing to an art audience. The website also contains a project area; it will function as a living forum for drawing. The exhibition and website will be presented to the public on April 3 when the Frost Art Museum also will host a panel discussion around drawing. MIAMI, FL (March 26, 2013)- The Patricia & Phillip Frost Art Museum at Florida International University will launch its first on-line exhibition and project space and host an introductory panel discussion for the project on Wednesday, April 3, 2013, from 5 pm-6 pm. Along with the panel, a reception will usher in The Drawing Project; What is line and how does it travel through space. This exhibition/project space will be live through September 3rd 2013, and the panel and reception are open to the public and free of charge. The act of drawing is quite possibly the oldest form of art. Through the millennium, it has shifted shapes with cultural changes and innovations, even taking on the form of written language as pictographs, cuneiform, and hieroglyphs turned into written words and binary code. This project responds directly to the notion that a drawing is not only an object, but an action as well: the trace of a point in motion. This definition and the constantly shifting boundaries of space are what the project is seeking to respond to. Parts of the website www.drawingproject.frostartmuseum.org are currently live, and the full site will launch April 3rd. Although the exhibition will be complete, the site itself is not finite. Check back regularly to see additions to the ‘to write’ and ‘to document’ galleries, as well as the Project Space and the On-line Residency. Panel Discussion: What is line? The Drawing Research Network (DRN) was established in 2001 as part of the Campaign for Drawing. The DRN is an international network of individuals and institutions who are involved in some way with improving our understanding of drawing. It aims to use this knowledge to raise the profile of drawing and drawing research. The Frost Art Museum opened its current 46,000-square-foot state of the art building in November 2008. Admission to the Museum is always free. The Frost is an American Association of Museums accredited museum and Smithsonian affiliate and is located at 10975 SW 17thStreet, across from the Blue garage and adjacent to the Wertheim Performing Arts Center on the Modesto A. Maidique Campus. Hours of operation are Tuesday through Saturday 10 a.m. – 5 p.m. and Sunday noon-5 p.m. Closed on Mondays and most legal holidays. For more information, please visit http://thefrost.fiu.edu or call 305-348-2890. Follow us on Twitter and Like Us on Facebook. Florida International University is one of the 25 largest universities in the nation, with nearly 50,000 students. Nearly 110,000 FIU alumni live and work in South Florida. Its colleges and schools offer more than 180 bachelor’s, master’s and doctoral programs in fields such as engineering, international relations and law. As one of South Florida’s anchor institutions, FIU is worlds ahead in its local and global engagement, finding solutions to the most challenging problems of our time. FIU emphasizes research as a major component of its mission, with research expenditures of more than $100 million per year. For more information about FIU, visit FIU Online.